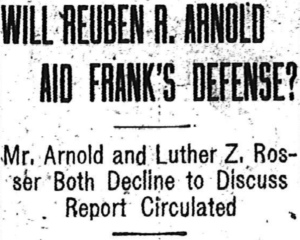 The rumor that Reuben R. Arnold, famous Georgia lawyer, will be associated with the defense of Leo M. Frank, indicted for the Mary Phagan murder, is persistent. Luther Z. Rosser, who has been retained in the case since Frank was first arrested, refused to deny or affirm the rumor. It is intimated, however, that negotiations are not complete as yet. Mr. Arnold himself, when questioned about the rumor, refused to discuss it in any way, and his silence has added weight to the report that he will be in the case. With Luther Rosser and Reuben Arnold leading the defense of Frank one of the greatest legal battles in a criminal case in the history of the south is promised. Mr. Arnold and Mr. Rosser have been pitted against each other in the famous McNaughton-Flanders case and in other well known trials, and each time they met there was a legal battle royal. With the two famous lawyers together, a hard and brilliant fight is certain to be given Hugh M. Dorsey, and Frank A. Hooper, the experienced prosecutor who has been engaged to assist the state in the case. Despite the entry of Mr. Arnold there is said to be little chance that Solicitor Dorsey will have assistance other than that of Mr. Hooper. Mr. Arnold during the past several weeks has been engaged in the trial before an auditor of the famous Crawford will case. He is said to have closely followed the many developments in the Phagan murder investigation, however, and if he enters the trial, it will not mean necessarily that a postmentment [sic] will be asked by the defense, although it will make a postponement of the trial more probable. The calendar for the criminal division of the superior court for the week commencing June 23 has been made up and published by E. A. Stephens, the assistant solicitor general. […]superior court will be in session on that date. It is said that there is sufficient business of a routine nature pending before the court to occupy it not only during the week of June 23, but through the week of June 30 as well. It is known, however, although there has been no definite announcement, that it is the intention of Solicitor General Dorsey to bring the case against Leo M. Frank to trial on June 30, if possible. Attorney Frank A. Hooper, who will assist Mr. Dorsey in the case, has declared that the state is ready to go to trial at once, and he intimates that efforts to push the trial will be made. As a result of the attitude of the state’s officials, speculation over the case turns to the defense. Will Attorney Luther Z. Rosser announce ready, if the case is called Monday week? Mr. Rosser will not discuss the matter. It is known that he has been engaged in the courts in trial of various civil cases practically since the time of Frank’s indictment, and for that reason it is said that he probably would want a postponement of the case. However, it is known also that regardless of the amount of work he has on hand, Mr. Rosser seldom asks for the postponement of a trial. In fact, he is more often found announcing “ready” than are the majority of other attorneys in Atlanta. If an effort is made to postpone the case at all, it is said that it will be to postpone it until early fall. The courts generally take a vacation during the months of July and August, and the trial of Mrs. Daisy Grace last July demonstrated the general unpleasantness of a big criminal trial during the summer. Last year during the Grace trial it was so stifling and hot in the poorly ventilated criminal court room on the fourth floor of the Thrower building, that it was generally considered dangerous to the health of those engaged in the case and of the spectators who thronged there, to hold the trial in the room. As a result it is probable that the scene of activity will probably be transferred to the old city hall, if the Frank case does come to trial in June. All of the civil courts will not be in session in the first week in July, and one of those rooms probably will be utilized.